CHIMNEY SYSTEM DAMAGE IS NOT ALWAYS CAUSED BY CHIMNEY FIRES. 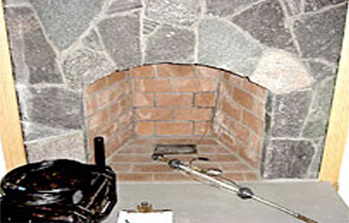 Although chimney fires are a prime cause of chimney system damage, problems can arise from many other sources. 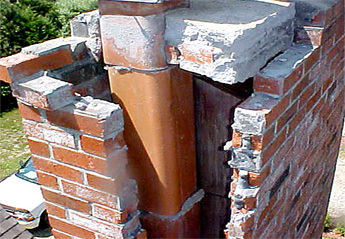 In this photo, a direct lightning strike caused severe damage to the masonry and the clay flue liner. Other common causes include settling, acid deterioration, and lack of maintenance. Dramatic spalling as seen here is often caused by infiltration of water and ice. Investigations inside the flue can also reveal cracks that can be potential fire hazards that lead to significant losses. Faulty construction or improper maintenance are among the possible causes in these instances. 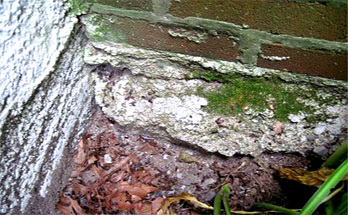 Settling and deteriorating foundations, often beneath the surface and not readily visible, can cause a masonry chimney to lose its integrity and fail. A chimney flue inspection by our CSIA Certified inspectors will reveal the true cause of chimney damage and provide repair direction that will prevent future claims. 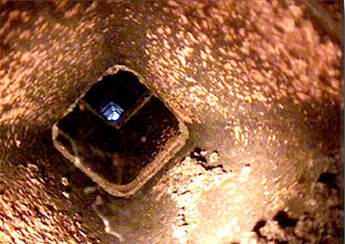 ISE uses the latest electronic technology to inspect hidden portions of the chimney liner that are not visible from the outside.